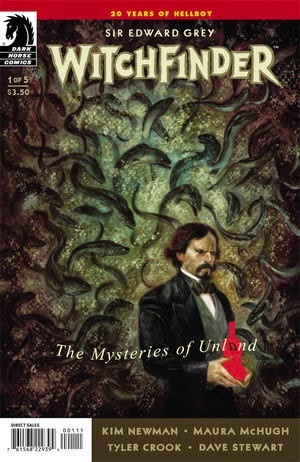 The Fellowship was fortunate enough to obtain a copy of WITCHFINDER: THE MYSTERIES OF UNLAND #1 from Dark Horse Comics. Kim Newman and Maura McHugh write, Tyler Crook draws, and Dave Stewart colors. Sir Edward is a bit perturbed. He’s been called in to investigate what appears to be a simple murder, rather than the more interesting fare he’s accustomed to. Chap drowns in a hotel, nothing to it. But this one was a servant of the crown, so off Sir Edward goes. The locals have their own ideas, but it doesn’t take Sir Edward long to find a clue or to get into trouble. It will most certainly prove a more interesting job than he first thought. Grey is a newer character in the Hellboy universe, and this story is set at a time when he’s still in the good graces of Queen Victoria. His science and supernatural knowledge are pretty obvious here, and so is his attitude. But that’s not unusual in Mignola’s characters; in fact, it tends to make them fairly entertaining and all the more human. He’s a great example of a Victorian adventurer, really. There isn’t much chance for the art to shine here except for the constable’s story, which is nicely styled. This is a good beginning to what looks to be a really cool supernatural adventure. I’m really looking forward to this. WITCHFINDER: THE MYSTERIES OF UNLAND #1 is available now at your FLCS or at darkhorse.com.